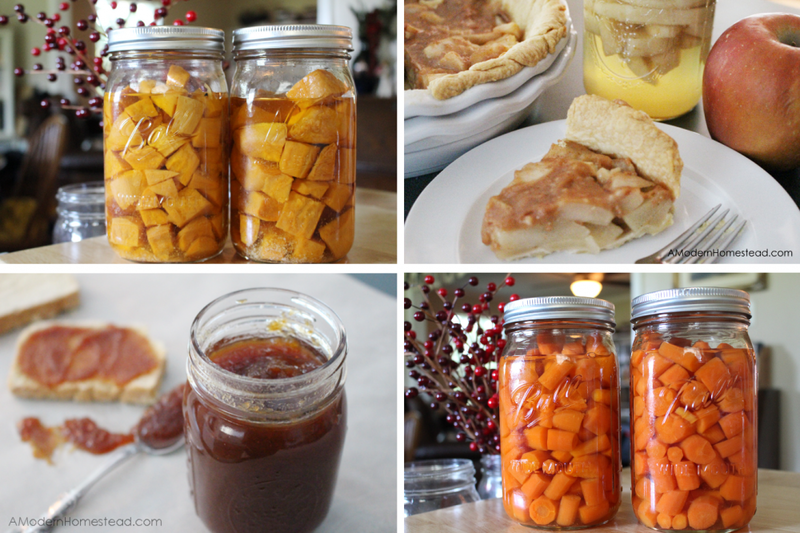 Canning may seem overwhelming, but it really is quite easy and safe. While pressure canning requires special equipment, water-bath canning does not! You just need a large stock pot and some mason jars. 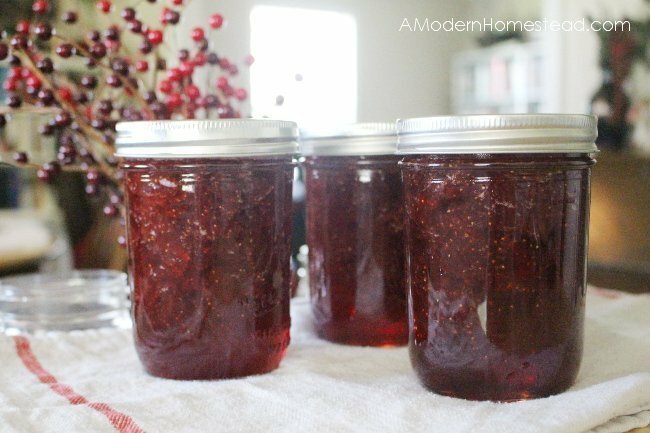 If you’ve never canned before, strawberry jam is a great way to get your feet wet. Not only is it delicious, but it makes an amazing gift too. 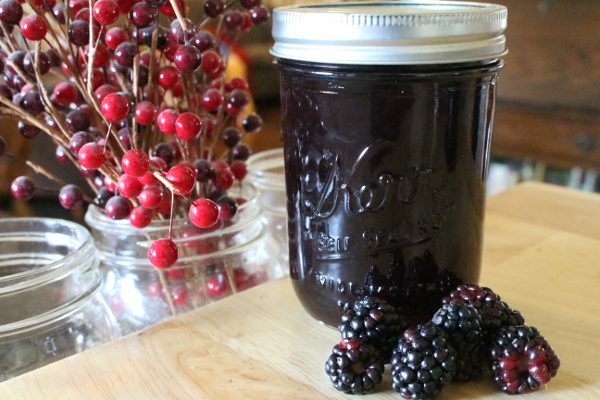 This step by step guide will help you get started canning today. 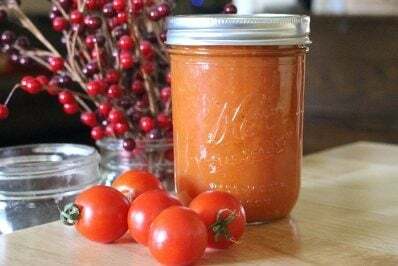 Though this guide is for strawberry jam specifically, the general steps are the same for any fruit or tomato dish you’d like to can. 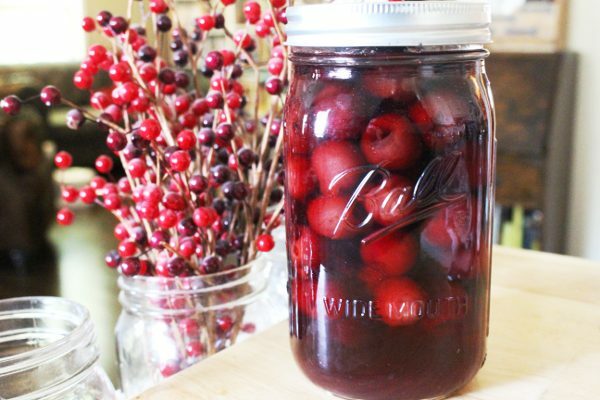 Just make sure you check out the different cook times for the particular fruit you are canning. This is for making the jam. It needs to be fairly large since the jam will bubble up quite a bit. Make sure it’s large enough to keep the jam from overflowing! This is to sterilize the rings and lids. 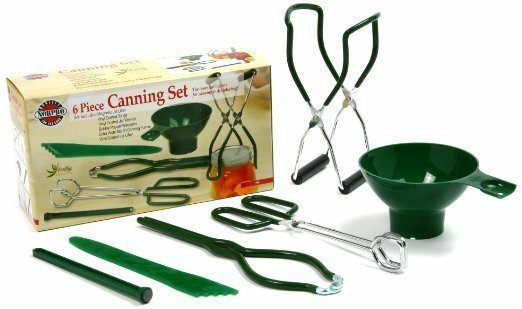 This set is extremely affordable and includes all the tools you will need to pack your food for both water bath canning and pressure canning. 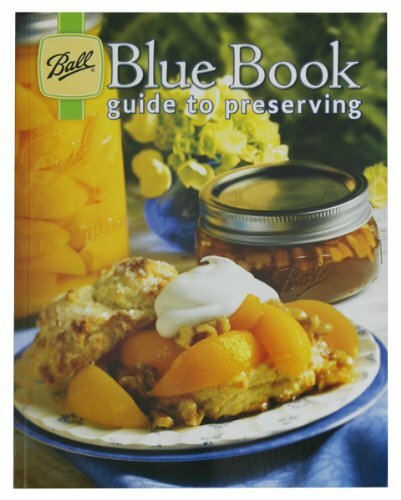 I also recommend getting the Ball Blue Book. While not 100% necessary, this book is an amazing resource for tried and true, time-tested canning recipes. Even though I’ve been canning for over a decade, I still reference it every single canning session! Once you have everything gathered up, it’s time to can some jam! 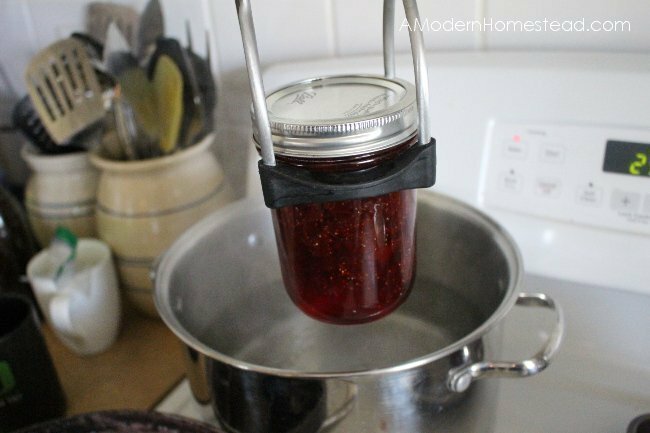 Learn to can food using the water bath method and end up with the best strawberry jam you'll ever have! Wash the jars by hand using soap and hot water. Do the same with the rings and lids. Place jars only on a baking sheet and place in the oven. Leave there until jam in finished. Next wash and slice strawberries. Add them to your large jam pot. Start mashing them one layer at a time until all strawberries are cut and mashed. I use a sturdy whisk or a potato masher for this step. Remember that any chucks of strawberry you leave will end up in your jam. That's not a bad thing, just be aware! Place jam pot on the stove and add the sugar. Stir until mixed well. With heat on med-high, stir regularly until sugar is dissolved. While sugar is dissolving, fill your canning pot a little less than half-way with water and start bringing to a low simmer. Once sugar is dissolved, turn heat up to high and stir constantly. After 15-20 minutes the jam will start to thicken and coat the stirring spoon. At this point, remove the jam from the stove and the jars from the oven. 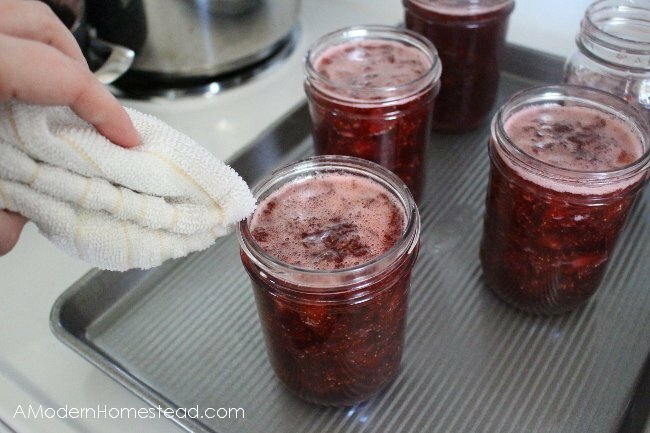 Remembering that the jars are very hot, place the funnel into the jar and position them where you can easily fill the jars with jam. Ladle in the hot jam, being careful to leave a 1/4" headspace (the amount of air left in the jar from the top of the jam to the top edge of the jar). Once all jars are full, use the bubble remover. Place the tool all the way into the jar until it touches the bottom and run it along the entire wall of the jar. This will remove any air bubbles that might cause bacterial growth. Use a clean dish cloth or paper towel, wet with some boiling water from the lid/rings pot, to clean the top rim of the jar. Be careful not to drip water into the jam! 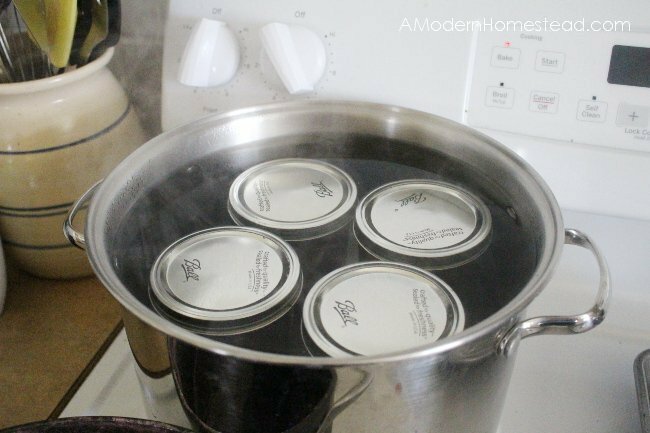 Carefully remove a lid and ring from the hot water and place them on each jar. Hand-tighten only. Using the jar lifter, place 5 jars into the canning pot. 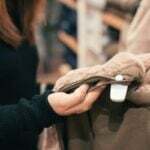 Make sure that they do not touch. If they touch during the canning process, they could shake too much and break. Make sure that there is at least 1 1/2" - 2" of water covering the top of the jars. If there isn't, add more hot water. Turn the heat up to high until a full boil is achieved. Once a full boil starts, set a timer for 15 minutes. After 15 minutes, use the jar lifter to remove the jars from the boiling water. 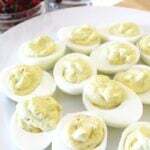 Place them on a towel and do not move them for at least 6 hours. Listen for a popping noise over the next hour. That is the jar fully sealing! Make sure to check that all jars have sealed. If they haven't you can try to process them again in the water bath, or simply place them in the refrigerator and use them first! 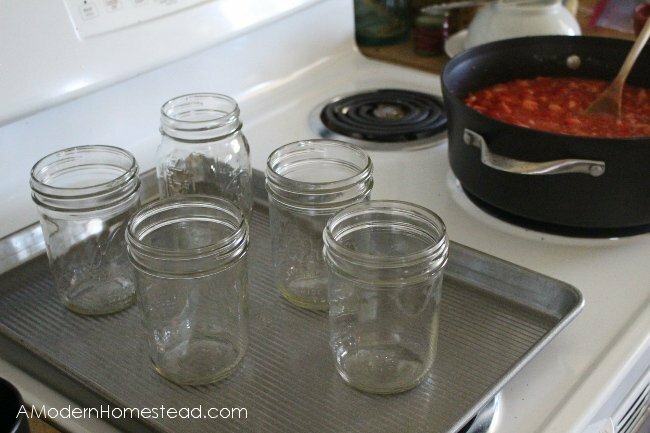 How to Freeze Tomatoes for Easier Canning Months Later! Mine did not set. At all. Followed directions to a T. I am so disappointed. What a waste!! Never again will I not use pectin. Hi Amy, I’m sorry to hear that! If you still have the jam you can just boil it a bit longer and can it again. Depending on the temperature and altitude where you are the recipe may need a little more boiling time. Please note, jam and jellies cannot be doubled or tripled as this will cause them to not set up. This is true for any jam or jelly recipe. 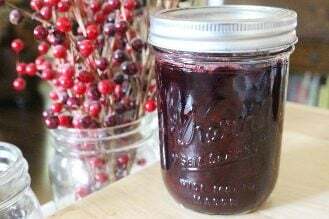 I make 40-50 pints of this jam every year (my husband goes through it like crazy) and it sets up perfectly without pectin. I do make it in single batches though to ensure it sets up correctly. Thank you for your reply! I do still have the jam and I was wondering if I could open them, cook longer, and then reprocess. I didn’t know if that was a no no. So, that’s great news that I can use the same jam and try again!! No wasted food which makes my heart smile. Lol! 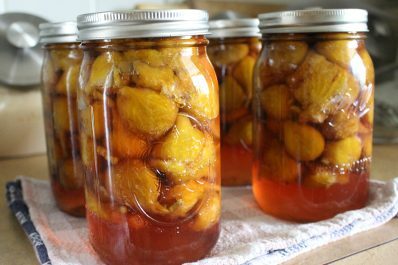 As I am reboiling, can I add some liquid pectin to help it set up better? Oh good! I’m glad you still have it! Whew! 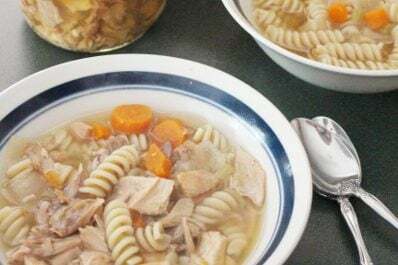 You can add pectin if it makes you feel more comfortable, but the reboiling should take care of it! Have you opened a jar yet? You might open one to test it. I’ve had a few batches (not of strawberry) look runny but were perfect when opened. Just a thought! Wishing you a perfect set up this time around! 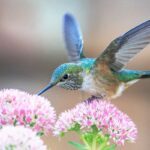 So you use pectin? Everyone keeps telling me I have to use it. Hi Melanie! No, I do not use pectin at all. 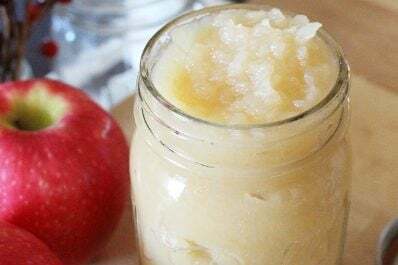 You can find recipes with pectin, but this site does not include pectin at all! So if that’s what you’re looking then you’re in the right place! 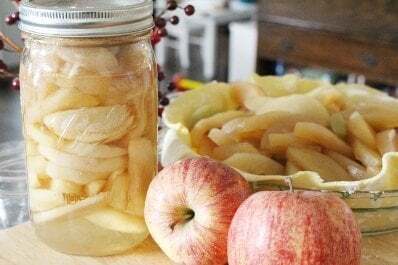 What will the texture and consistency be like without pectin? Also, I’m looking for a low sugar recipe. Could I just use 4-5 cups instead of 9? Will that make a drastic difference in the taste? 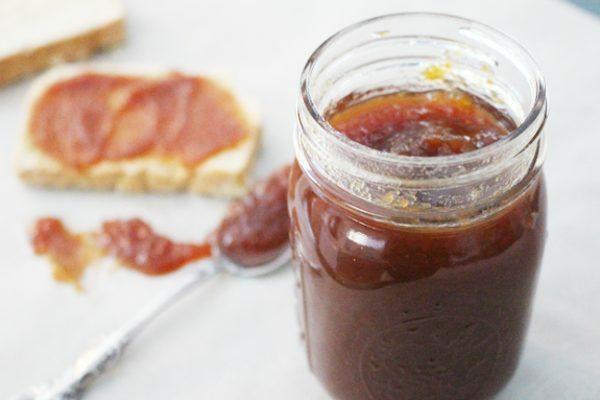 I’ve never had jam made with pectin (allergic), so I’m not sure how to compare. But any jam/jelly you get at the store is usually just made with sugar, not pectin. It’s delicious and thick, that’s all I can say. Haha! 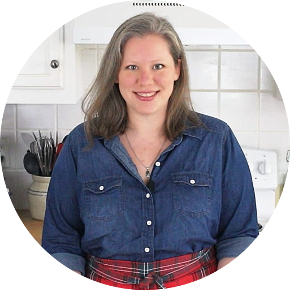 As for a low sugar recipe, this recipe cannot be changed because the sugar content is what creates the jelled texture. If you reduce the sugar, you would have to boil it longer (removing more water) and then you’d end up with the same sugar ratio as the original recipe. But keep in mind, you’re only having a bit of the jam at a time, so it’s not too bad! Good luck and thanks for stopping by!